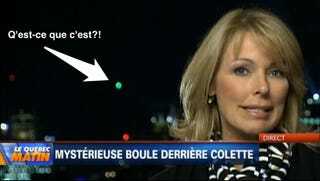 This terrifying, greenish UFO appeared hovering over Montréal last week, right in the middle of an evening newscast. It appeared to change shape and plunge to earth. Now there are reports of the same "mysterious ball" cropping up in Lima, Peru. What is this thing, and what is it doing? The UFO was greenish and changed shape. Sometimes it resembled a saucer, and at other moments it had an aspect similar to a "boomerang". The witness thought she was seeing the maneuvers of a remotely guided airplane, but it had no intermittent lighting. Furthermore, a remotely-controlled airplane must have anti-collision lights, by law. Two days earlier, during a live broadcast by TVA News, a Canadian network, a mysterious greenish object similar to this one appeared behind reporter Colette Provencher. Could it be the same object? You be the judge. Here's the Lima UFO, in the video below. I'm going to say it's the same object, because it just makes sense that you'd want to hop from Montréal to Lima, especially if you like good food and Romance languages. I mean, if this UFO was traveling as fast as I suspect it can, its pilots could have had yummy crepes in the morning and delicious ceviche in the evening. My point is that you just can't argue with logic.